Wow. I haven’t written one of these in a while. But as Season Two of The Walking Dead releases tomorrow and as I hit more scenes in my Outline that need to be completely overhauled, I felt now was a perfect time to get back to my Games for Writers series. I have a tendency to buy critically acclaimed titles and just leave them alone for years (I’m still sitting on Fez). In most cases it’s because I know something intense and high quality is waiting and I want to be sure I’m ready for it. 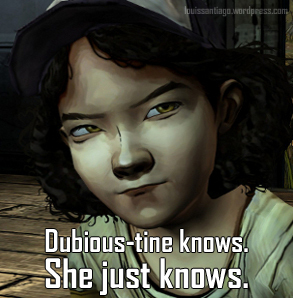 That was especially true with Season One of Telltale’s The Walking Dead series. I was told the ending was heartbreaking and I generally prefer to control my intake of “heartbreaking.” So I put it off until this Halloween, at which point I discovered that oh man, seriously, I underestimated just how hard I would be hit by the story—particularly the last few hours. However, this article isn’t about the conclusion. While the drama of No Time Left, Season One’s final chapter, was really, really potent, there’s something a bit more practical and universal that makes this game worth a play for any writer. Not the concept of making people bawl their eyes out, but the concept of Choice when it comes to your characters and your writing. Yes, if there’s one thing I think writers should play The Walking Dead to experience, it’s the constant, inescapable presence of Choice. For writers, Choice is a very serious, very high stakes, and very constant factor in the story-telling process. The writer experiences it themselves the moment they take up their pen, because even that moment—before any words have even been set on paper—is steeped in choices: “Where do I start?” “Who’s in this scene?” “Where do I want this to go?” “What are these characters going to do?” I believe all writers know this, and I believe that even if a writer played this game simply to experience the way it trains you to make important choices, they will have gotten their money’s worth. Clementine will remember you said that. 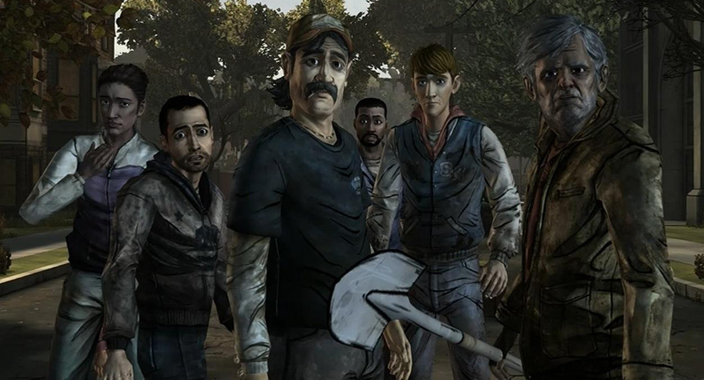 The Walking Dead, however, makes choice something that characters do. You can absolutely play it the way you want and make your own Lee with his own consequences, but the consequences are what make the experience, and those consequences are largely out of your hands because, most of the time, they’re based on the actions of NPC’s. 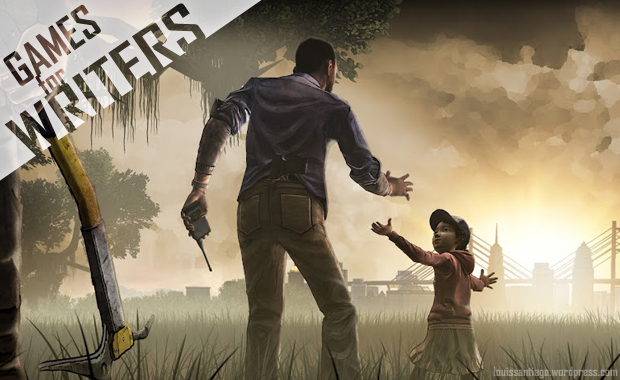 More than any other game I’ve played, The Walking Dead makes you believe and relate to the characters around you, even if you play a completely meta Lee. It does a frighteningly good job of making you understand why and how Lilly is crazy, for example, or most often and most clearly, what Clementine thinks of you based on what you say, do and tell her. To tie it in more tightly here, it shows you exactly how your decisions—your choices—affect others and lead them to choices of their own. In short, it gives you characters that feel frighteningly real and whose ability to think for themselves is absolutely a lesson any writer would benefit from experiencing. I don’t think every story can foster a host of character decisions, but The Walking Dead stands as a compelling example of how characters should act—alive. Self-centered. Real. There are almost infinite ways that scenes can work—almost infinite ways events can unfold in a story—based on the desires, beliefs and decisions of its characters. There’s an inherent pressure in writers to find the “right” scene. We reach for vaguely defined, optimal approaches—infinitely perfect moments—for each scene that we believe will make them perfect. In a lot of cases, this ideal scene is the beginning of our story and many of us wait for that lightning to strike until we sadly forget the expected shape of it and move on to something else. The thing is, there is no ideal—no brilliant first sentence that will shake everyone who reads it. That isn’t how writing works; no one falls in love with a novel because of its first sentence. People memorize the first lines of classics and brandish them on occasion, but the merits of classics are not in the sentences they begin with. They’re in the characters they begin with. And that is why I changed some scenes back to the way they were; when I chose to add or subtract moments in an attempt to find that ideal, I ignored what characters had done before as illogical. But then, during the actual rewrite, as I started to listen to my character’s decisions, I found that a lot of those ideal changes I made didn’t make sense; in the final version of my book, scenes either regressed to mirrors of older scenes with drastically different, more character-relevant tones, or I changed them a third time, based on how my characters felt and what other decisions they’d made. The lesson for me, and the one The Walking Dead makes clearly, is that the choices all of your characters make are as important as the choices you make as a writer. And those two things are not always the same and can’t always be the same; at the risk of sounding completely crazy, your characters can and will disagree with you and you have to let them. Even if it means you’re undoing your own work or sitting at your computer for hours trying to figure out—“Wait… so, if he does that here… that means… … <sigh>.” Put simply, if you don’t consider what your characters actually want to do or say—what they actually think and feel—in favor of putting them where you want them and speaking your words through them, you need to play The Walking Dead if only to be humbled. If only to realize that your character’s decisions can and should come first. All Likes, Comments, and Subscribes are appreciated as well, but regardless of those, I hope you have an awesome holiday!